WWP’s physical health and wellness programs challenge warriors physically and provide opportunities to learn more about fundamental health topics like workout techniques and nutrition. PHOENIX, Ariz. (March 20, 2017) – Physical health and wellness training is one of the best ways for warriors to lose weight and get active again. 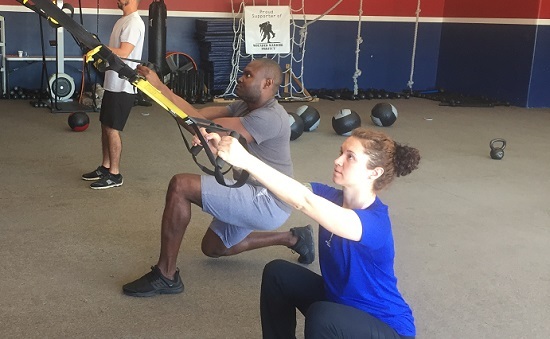 That’s why Wounded Warrior Project® (WWP) recently hosted a TRX suspension training session for a group of warriors looking to tackle their fitness and health goals. It was also an opportunity for connection; like all WWP program events, this TRX training session supports the long-term recovery needs of warriors by reintroducing them and their families to the unique bonds experienced during military service. As warriors assembled for the workout and trainers began to get everyone organized, Eric reflected on his physical state and when he last exercised. WWP’s physical health and wellness programs challenge warriors physically and provide opportunities to learn more about fundamental health topics like workout techniques and nutrition. They also provides mental benefits; in a WWP survey of the injured warriors it serves, 29.6 percent of survey respondents expressed physical activity helps them cope with stress and emotional concerns.